Available in English - soon to come in Danish. Pattern is written with a supporting chart showing the thumb gusset increases. 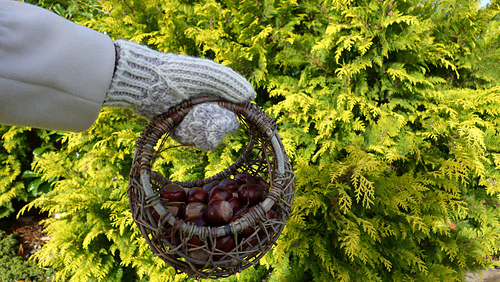 A hat and a fingerless gloves pattern is offered in the same series. If you buy one, you will get a discount on the others. Past purchase counts, so you don’t need to buy them all at the same time. Difficulty: Medium to advanced. 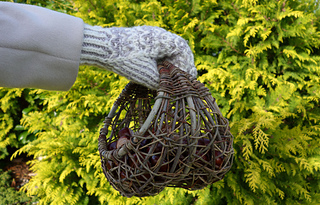 Two colour Italian cast on is used, and the edge of the mitten is worked in two colour double knitting. However, after the (in fact quite simple) cast on is done, each round is worked with one yarn at a time only, and so the double knitting is just knit or purl with slipped stitches between. The cast on and corrugated ribbing takes some practice to get perfect. The hardest thing to achieve in this pattern is an even gauge in the ribbing. Needles: US 8 (5 mm) double pointed needles or size to obtain gauge. Or use a long circular needle and magic loop. Holder or piece of scrap yarn for thumb stitches. Gauge: To get the intended fit, make sure you have correct gauge. Gauge is 18 sts to 4 inches (10 cm) in stockinette stitch. The two colour corrugated rib is 20 sts to 4 inches (10 cm). The body pattern is 19 sts to 4 inches (10 cm) and 10 rows to 1 inch (2.5 cm). Go up or down in needle size to obtain gauge. Sizes and fit: Adult woman sizes S (M, L), mitten measures 6 ¾ (7 ½, 8 ¼) inches or 17 (19, 21) cm hand circumference, intended to be worn with some negative ease, and 6 (6 ¾, 7 ½) inches or 15 (17, 19) cm wrist circumference. The pattern is very stretchy. Changing yarn: If substituting yarn, you will need yarn with a lot of body. A single almost unspun wool like the recommended yarn is perfect. Abbreviations used: k – knit, p – purl, wyif – with yarn in front, wyib – with yarn in back, tog – together, yo – yarn over, s – slip, st – stitch, sts – stitches.